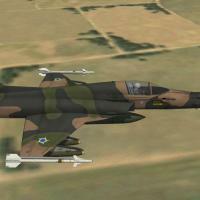 required F-5E Early Versions Pack 1.0 (cockipt and decals) to keep the original files and credits. 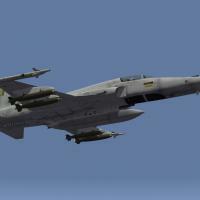 I had problem with afterburner, so this using the stock files. In Brazil, the history of the F-5 started in practice in March 1975, however, he was quoted to equip the FAB since 1965, in its version F-5A / B. In 1967, he was again contemplated, this time as a design vector SISDACTA. The preference was for the F-4 Phantom, but this was vetoed by the Americans, who in turn offered the F-5C (version proposed by Northrop with improvements based on the evaluation report made in Vietnam). The impasse U.S. favored the French, having acquired the FAB 16 Dassault Mirage III. A new international contest held in 1971 to replace the AT-33A, attended the Fiat G-91, MB-326K, Harrier Mk-50, Jaguar GR1 and A-4F, won by Northrop fighter now in his version F-5E. Began a long and successful history of the Tiger II in FAB, which still continues today and is expected to last until 2018. The FAB received six F-5B (FAB 4800-4805), 4 F-5F (FAB 4806-4809) and 58 F-5E (FAB 4820-4877) that were acquired in two separate batches. The first batch in 1973, factory direct (06 F + 36 F-5B-5D), the value of $ 115 million and the second batch in 1988, former USAF (04 F-22 F-5F and 5E), the total cost of $ 13.1 million. The first aircraft of "Operation Tiger", became known as the transfer of the first batch were delivered from February 28, 1975 in Palmdale. Were three F-5B, which arrived in Brazil on 06 March of the same year, followed by another three F-5B on 13 May. On June 12, 1975, came the first 4 F-5E to BAGL, starting an airlift that ended on February 12 of the following year, totaling 36 aircraft. In 1985, after much searching, we reached an agreement with the Reagan administration, which agreed to negotiate 4 F-5F and 22 F-5E, which would come from the ranks of the USAF, at a cost of $ 13.1 million, a trifle. 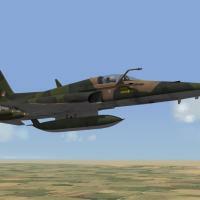 Around September 2006, it was speculated acquisition of 9 aircraft F-5E Tiger II, used in Saudi Arabia, 6 F-5E and F-5F 3. This purchase, however, went no further, come to the Brazilian Air Force to acquire a lot of aircraft of the Royal Jordanian Air Force. 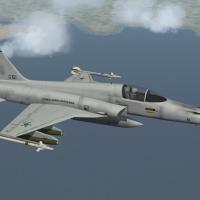 In total 11 aircraft were purchased, and 8 single-seat F-5E and F-5F 3 seaters. The first aircraft coming from Jordan arrived in Brazil on August 19, 2008 and were sent to the Air Force Material Park of São Paulo (PAMA-SP). All the F-5 ex-Jordan should be converted to the standard F-and F-5FM 5EM. Sophocles for his superb cockpit work. Every switch is a work of art. Crusader for his ini file magic, really makes the cockpit and plane come alive. Paulo for his mammoth decaling work which he allowed me to use. and even helped me by reworking some of it. The rest of the Combat Ace community. Without you guys I would never have bothered to make it this far.